Have you ever wondered what it would be like to go on one of those Medical Missions you hear about from time to time? Well, Laura Mueller has been gracious enough to share her story with us. When I went to the cytology meeting in September of 2016 I was hoping to keep in touch with the latest advances in the field of cytology. I had no idea that this meeting would provide me with an opportunity to participate in a missions trip. I had always longed for an opportunity to use my skills with a missions trip but the trips I had heard about only needed nurses or med techs. So during the business meeting when Katie Hughes, the Hologic rep, mentioned that she participated in a Medical Missions trip and that she needed someone to come along with her my ears perked up. Katie told me more about the trip during lunch and I decided to go. 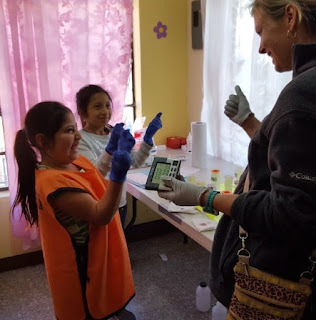 This January, Katie and I hopped on a plane with other medical professionals and headed for Sumpango, Guatemala. We spent the week in Los Olivos church working at a medical clinic. There were two OB-GYN doctors who traveled with the team. They collected Pap smears and we stained and screened them while the doctors finished the rest of their evaluation. The doctors were able to give the patients the results of their Pap tests before the patients left the clinic. Follow up appointments were arranged for any women who had abnormal Pap results. The Woodlands Church in Plover, WI participates in multiple Medical Missions trips per year. They would like to build a contact list of people who are interested in participating. The trips are usually scheduled to fly out on Saturday and arrive home the following Sunday. Dates for the next trips are not finalized yet. Most likely the trip to Guatemala will occur the second week of January. Another trip for Cartagena, Columbia usually takes place the third week of January. What my experience was like. After I signed up to participate on the missions trip I was invited to come to Woodlands church for two meetings where I could meet other team members and learn what I needed to do to prepare for the trip. On the day of departure they offered several options. We could meet at the church in Plover and take a bus to the airport. We could meet the bus at stops along the way to the airport. We could meet at the airport in Chicago, or we could meet at an airport with a connecting flight. Once we were in Guatemala the church took care of everything. Transportation, meals and lodging were all provided. A friend from Guatemala met us at the airport and acted as our cultural guide. At the orphanage, we slept in rooms with 10 - 14 sets of bunk beds per room with attached bathrooms and showers. Just a little about the orphanage, Misioneros Del Camino, was founded by Mrs. Leonor Portela in 1986. Leonor was widowed with a six months old son in 1961. After a devastating earthquake in Guatemala in 1975 that left 23,000 dead and 100,000 injured, she traveled to Guatemala taking aid for the victims of the earthquake. 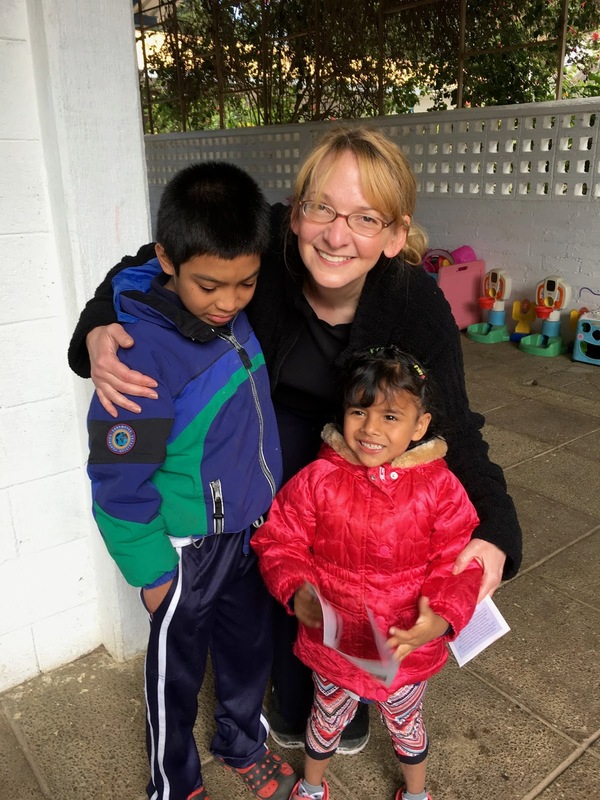 While in Guatemala she felt a calling from God and opened a home for children. They complex we stayed in is one of the ways the orphanage raises money to support the children they help. It greatly impacted me to know that the lady who currently oversees the day to day operations at the orphanage was also raised there as an orphan. Our team consisted of medical professionals (two internal medicine doctors, two OB Gyn doctors, an Orthopedic doctor and a Pediatrician), medical students, nurses, two cytotechs and family members who did not have medical backgrounds but were able to help in other ways. In Guatemala we were met by Medical Students from Guatemala. These students volunteered their time and served as our translators. 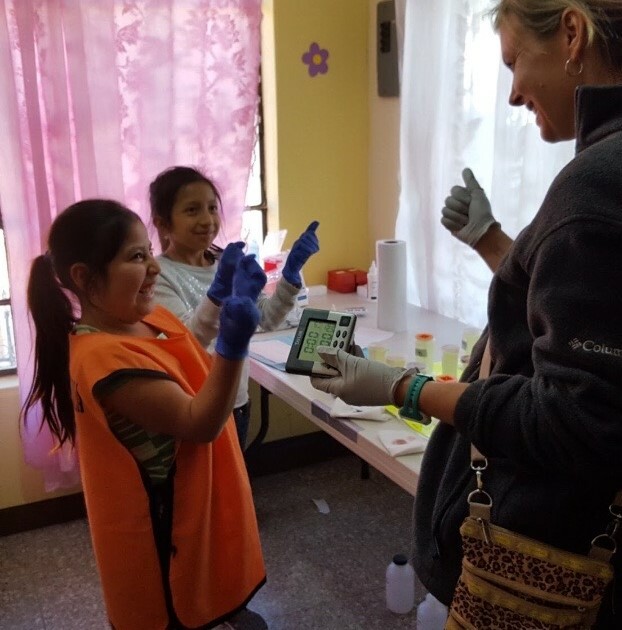 The Guatemalan medical students came from upper-class families and found it a cultural experience to interact with the rural community. A little about Los Olivos church. This church agreed to partner with Woodlands Church 10 years ago. At first they rented the community center and the church helped as crowd control, etc. Over the years the church has recognized where they could play a greater role as part of the clinic so they began to make appointments to minimize the patient lines. They also trained groups of volunteers to meet with each patient and offer them real-life assistance in their daily living. The church also coordinates follow up care. For instance, the Woodlands medical team takes the prescriptions for eyeglasses home with them and then mails the finished eyeglasses back to Guatemala. The church will contact these patients to let them know when their glasses arrive and arrange for the patient to pick their glasses up. 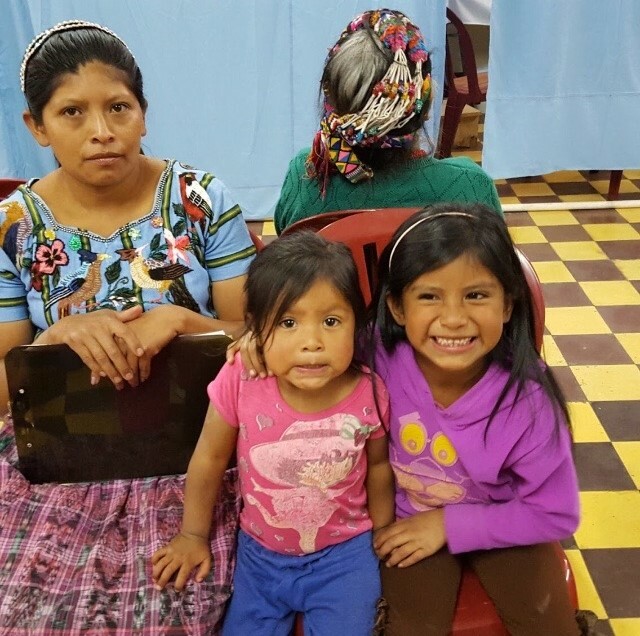 All of our patients were of Mayan descent. Because the church realized the medical help we were offering the patients was at best temporary relief they also realized that the most important connection we could offer them was a connection to the church. To do this each patient was given the opportunity to meet with church members after their doctor visits. One of the more profound stories was a mother who had just lost her husband. The church was able to come along side of her and offer her support meeting the her needs of those of her children. Each morning and evening we met in a central location to prepare for and debrief from the day. This allowed all of us to share stories and feel unified as a team. As cytotechs we had nine year old girls helping us stain slides. 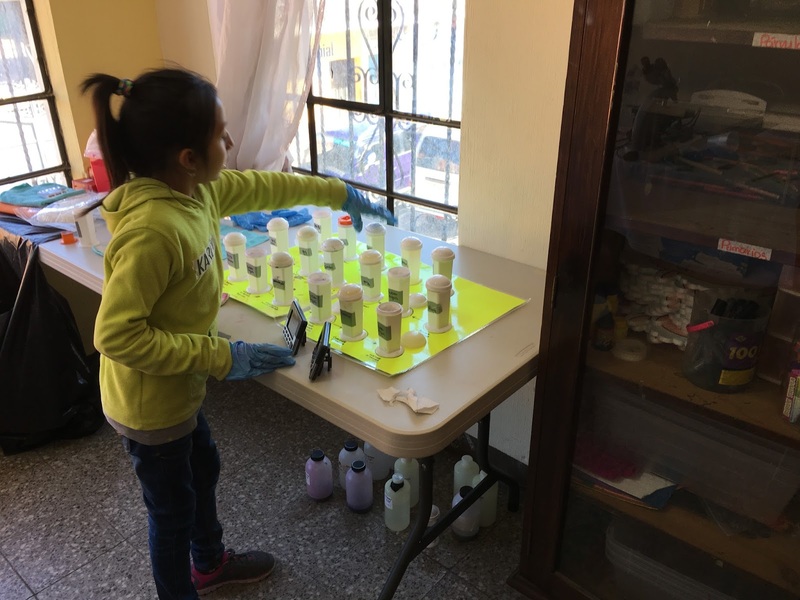 The church was grateful that these girls were able to experience that they smart enough to work in a “lab” and perform technical work. The last day we spent in Antigua. This city was founded in the 1500s and used to serve as the capital city of Central America until frequent earthquakes encouraged them to move the capital to Guatemala City. Next year the team will be going to a more rural area. They will be working with 25 rural churches. Instead of staying in an orphanage they will be staying in a hotel with 2 people per room. An estimated 20 % of people will be severely malnourished. Again, all food and lodging will be provided as part of the trip. If you would like to be notified about upcoming missions trip opportunities, please e-mail me at tlmueller9@yahoo.com and I will forward your information to trip coordinators. I would love to share stories and photos of my adventure with anyone interested.